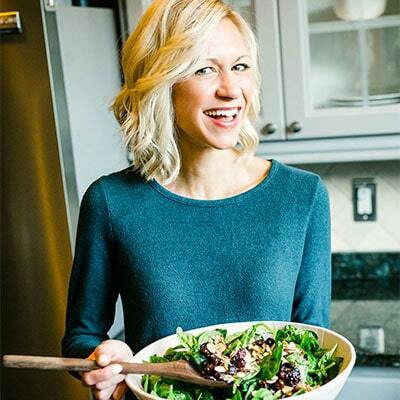 The Super Bowl is tomorrow, so I am sharing last minute easy game day recipes for you to make. 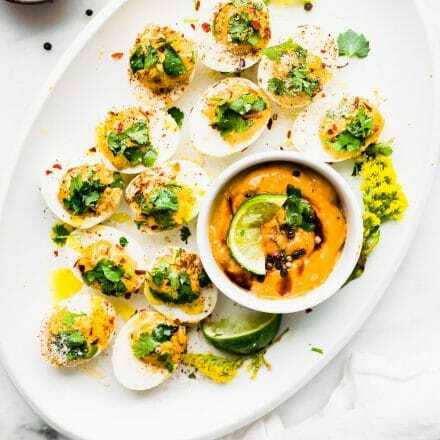 These are easy prep recipes for appetizers and snacks, and they’re healthy game day snacks , too! I don’t know about you, but when my favorite team isn’t playing in the big game, I still get excited to watch it. After all, you have athletic men running the field, an awesome half time show, and great Super Bowl commercials to watch. (Even though the networks have ruined part of the excitement, by airing them weeks ahead of the game this year. Grr.) And let’s not forget about the FOOD! I know, I know. 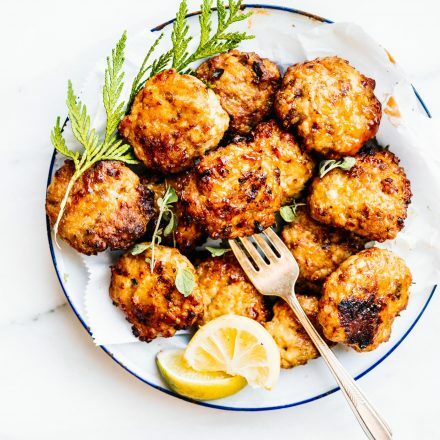 You might already have your Super Bowl Party Menu planned, but ya’ll, I’m bias. 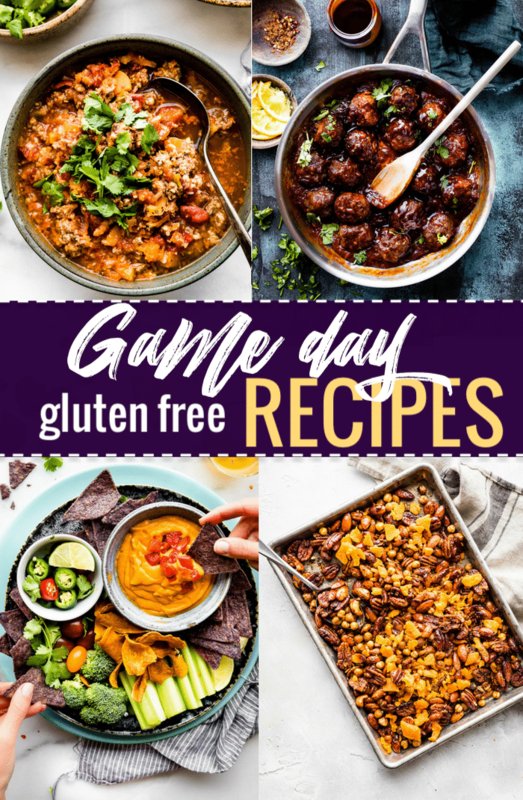 I think you should totally make up a few of these easy and healthy “game day” recipes and SCORE BIG! 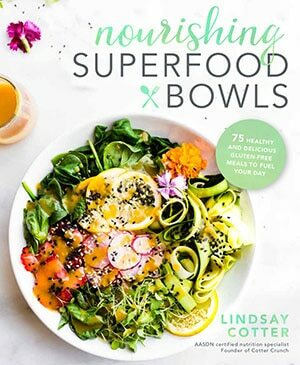 Cause you just tricked all those manly football watching men into eating healthy and grain free. Delicious and nutritious. Yep, WINNER! Corny Cotter Moment done. Let’s make some grub ya’ll! Oh and please enjoy the game! 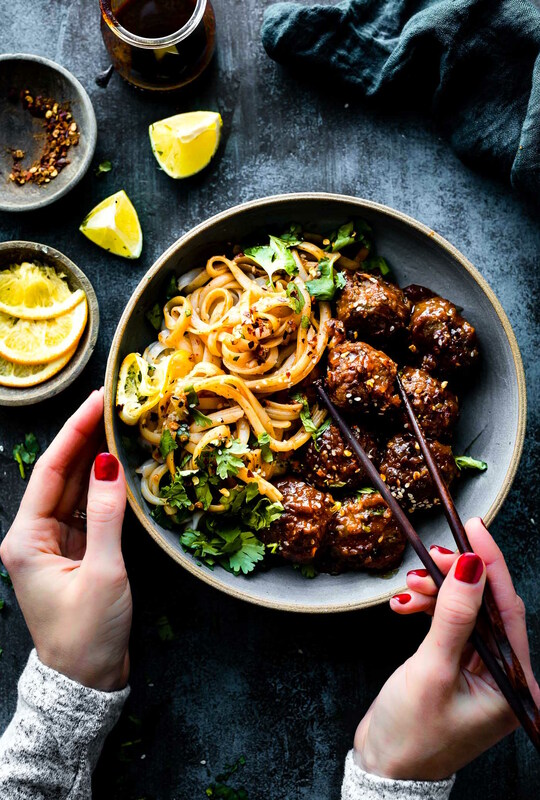 These Asian Style BBQ meatballs are quick to prep and cook in just 30 minutes. Natural ingredients, no refined sugar, and packed with lean protein. Freezer friendly ya’ll! Salsa con queso is an easy warm cheese dip recipe that will disappear as quickly as you make it! 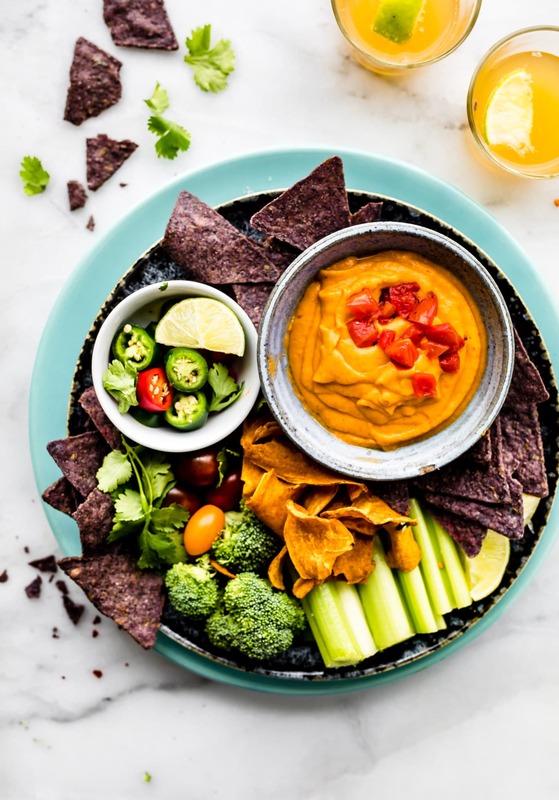 This vegan cheese dip is plant-based, using fresh vegetables and a hint of Tex-Mex spices, making it a family friendly dip that everyone will love. Whole 30 friendly. 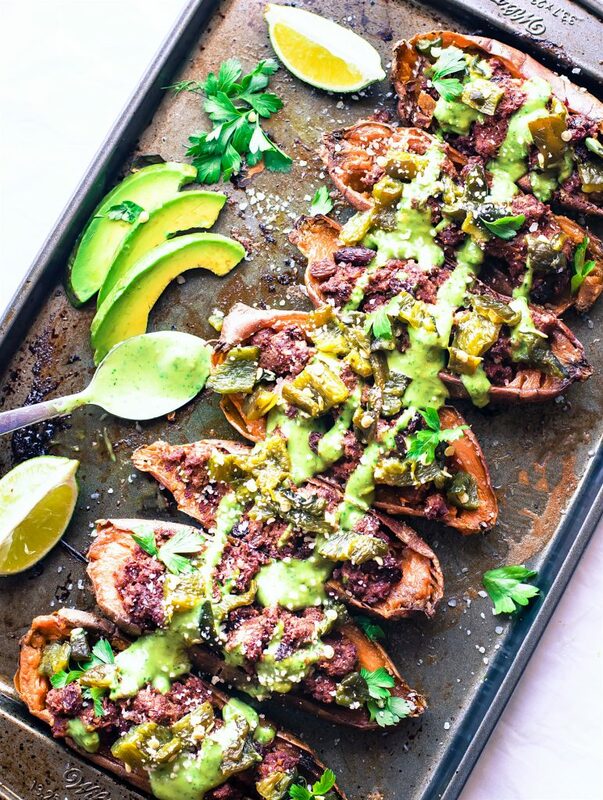 Ancho Beef Chili is stuffed into Sweet Potato Skins and baked up for an easy Paleo appetizer, game day snack, or meal! 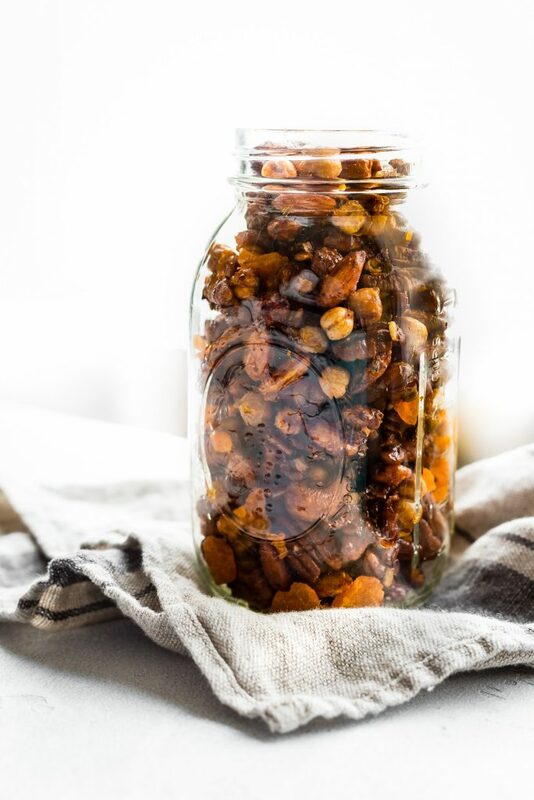 Candied chickpeas are the sweet bite in this Cajun trail mix, made easily in an electric multi-cooker! 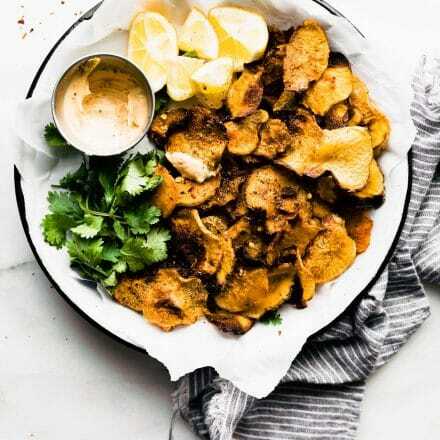 A homemade, healthy snack recipe that’s quick and easy to make. Vegan friendly, too! 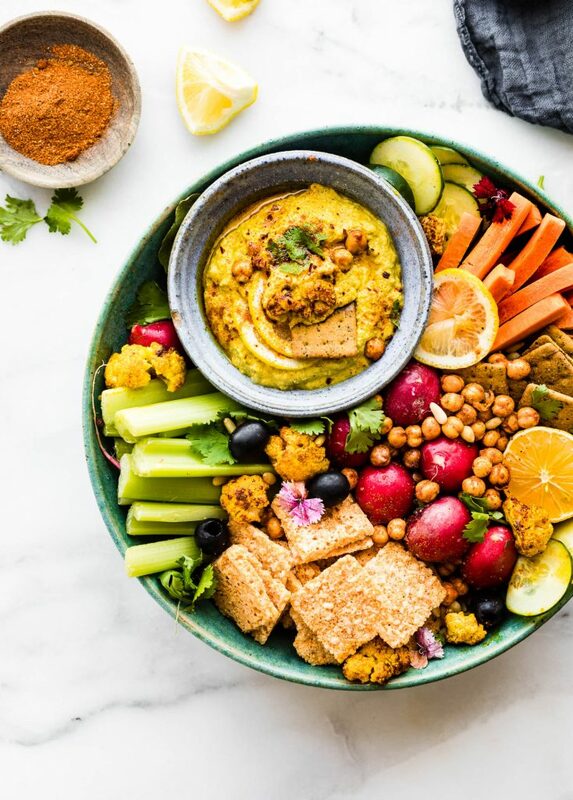 Tandoori Roasted Cauliflower dip is a flavorful creamy vegetable dip that is perfect for snacking, appetizers, or small plates. 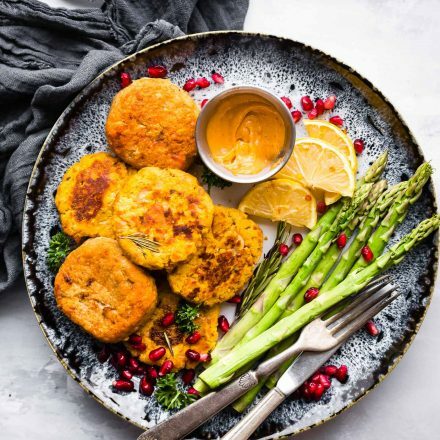 Greek yogurt, homemade tandoori seasoning, roasted cauliflower, and Parmesan make this dip filling and healthy. It’s one of my favorite easy game day recipes! Okay folks. Whatcha making for Sunday? Who’s gonna win? All bets are on! GAME DAY is here! I promised Vegas pizza… it’s her birthday weekend. I may have to make myself party food for one though! Oh happy bday Vegas!!! Maybe you make pizza and meatballs. Hehe 5 spice! Thank you so much for supporting Ryoma! Look at you playing up the cauliflower again. I still need to try that dip and your jalapeno cheese crisps, which didn’t make the cut, but totally should have. Blows kiss.